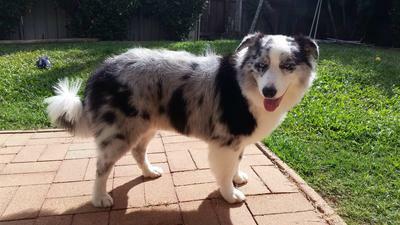 Is My Australian Shepherd Overweight? 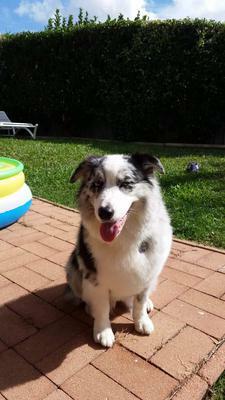 My Aussie Bella is 3.5 years old and weighs between 19 and 20kg, she is a bit short for her breed but very broad. We do agility and frisbee comps with her and she seems to be exhausted quickly. Someone said today that she was too fat and I was so shocked to hear that. We feed her one cup of kibble a day mixed with some chicken hearts or other chicken meat. What is your opinion and what can I do to help? Is this just how she is built? Comments for Is My Australian Shepherd Overweight? first off, how about a shot taken directly above her so we can see her waist? take two one dry and one wet. I think she looks fine, but if you're concerned you can always take her to your vet. I have mini, who is big for a mini, that weights about 15kg and she gets winded after excise as well. We portion control her food and limit treats and my vet said she was healthy, but shouldn't gain any more at 3 years old. Best to check.with your vet. I would check with you vet. If Bella is overweight your vet can tell you and you can switch to a lower fat food. My Aussie, Stella, is overweight at 52 pounds (she should be between 46-38 pounds). She has a partial tear in her ACL so we aren't getting much exercise. Your Bella is only 44 pounds, which I would think is within the recommended weight for the breed and activity level. Ok thanks all. I will go to the vet and get him to decide. I have an Aussie who is currently a year old. Many people told us he looked big for his breed, so we decided to take him to the vet. Turns out, Dexter (my Aussie) was just more muscular than many other aussies. The vet said he was at the perfect weight and that his broadness was due to his muscular form. This is probably the case for you're dog, but if you are still concerned, I would take her to the vet. My toy Australian Shepard is 37.5 lbs!!!!! We have had him for almost 10 years and every time we brought him to then vet he just kept gaining weight. The vet could never diagnose it, and we still don’t know to this day. He has always been an active and playful dog tho never once turned down a game of catch.